Spotsylvania Animal Hospital has provided affectionate veterinary care to the animals of Virginia since 1981. When Spotsylvania Animal Hospital opened in the early 1980s, our beautiful hometown was smaller, and much more rural. Likewise, our original patients were farm animals. In the decades to come, Spotsylvania’s countryside charm attracted more and more people, and with them came new breeds of clientele: dogs, cats, plus domesticated exotics like lizards, ferrets, and even the occasional snake! And all that time, Spotsylvania Animal Hospital, located near the courthouse, has remained central to the community that grew up around it. For example, our own veterinarian, Dr. Siefker, often provides expert testimony for the Spotsylvania County Courthouse. We are also proud to be Spotsylvania Sheriff Department K-9 unit‘s preferred care provider for the Labrador Retrievers, German Shepherds, Belgian Malinois, and Bloodhounds employed in their canine units. We support our local veterans, too, by helping the non-profit Leashes of Valor in their mission to pair in-need veterans with service dogs. Additionally, our veterinarians work with Spotsylvania Animal Control to aid abused, sick, or injured homeless animals, and help local wildlife rehabilitators care for injured fauna. Spotsylvania Animal Hospital treats all animals with love, respect, and care, and would love to welcome your pet to our family! Meet the Veterinarians & Team of Spotsylvania Animal Hospital in Spotsylvania, Virginia! For more information or to setup an appointment, call us at 540-582-6370 to speak to one of our top-rated staff members! Maryland native Dr. Siefker has loved animals from a young age. She followed her passion all the way to the Virginia Maryland Regional College of Veterinary Medicine, where she received her Doctorate in Veterinary Medicine in 2003. She has been at Spotsylvania Animal Hospital ever since. Dr. Katherine, as she’s known around the office, treats dogs, cats, exotics, and even the occasional farm animal. She is passionate about preventative care, pain management, and helping owners strengthen the bonds with their pets. 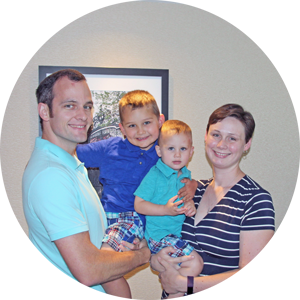 When not at work, she spends time with her wonderful husband and four amazing children. Her family also includes three dogs—Tank, Bella, and Arlo—plus a cat named Mittens. Whenever she isn’t at work or with family, Dr. Katherine loves to take naps. She also enjoys reading, running, and taking leisurely walks with her dogs. Dr. Corbett, a Massachusetts native, wasn’t always going to be a veterinarian. She originally received her degree in finance, from the University of Massachusetts, Amherst in 2003. She worked in banking for about two years, but then quit her job and moved to California with her husband. There, she decided to pursue a job that let her continually learn, be challenged, and work to strengthen the bond between animal and human. She enrolled in medical school, and eventually received her DVM from Western University of Health Sciences in Pomona, CA in 2012. Following veterinary school, Dr. Corbett interned, and was eventually hired, at an animal hospital in West Los Angeles. Then, in 2015, it was back to Massachusetts, where she has been practicing up until her move to Spotsylvania Animal Hospital in 2018. Dr. Corbett has a strong interest in wellness and preventative care, as well as acupuncture, dentistry, and internal medicine. 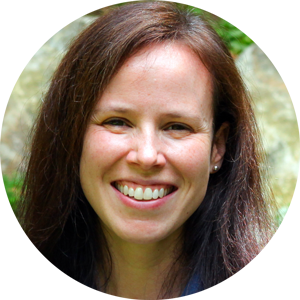 When not working Dr. Corbett enjoys running, biking, competing in triathlons and spending time with her husband, her dog Cooper, plus Hallie and Finnian, her two cats. 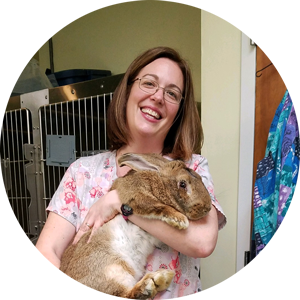 Dr. Baker has been working with animals since childhood—growing up in Massachusetts, she volunteered with local animal rescues. She moved to Virginia to pursue veterinary medicine, and received her DVM from the Virginia Maryland Regional School of Veterinary Medicine in 2012. After graduation, she practiced in Fredericksburg until 2018, when she joined the team at Spotsylvania Animal Hospital. She excels at performing all types of surgeries and has participated in multiple advanced training programs to hone her surgical techniques. Dr. Baker loves working with furry animals—dogs, cats, and exotic mammals. When not at work, Dr. Baker is helping her husband raise two rambunctious boys. They also care for two dogs, named Gus and Ellie, and a cat named Oliver. 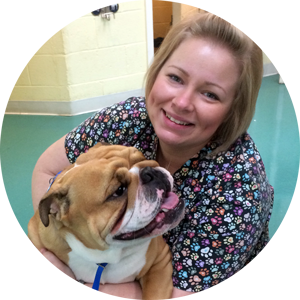 Jennifer joined Spotsylvania Animal Hospital in 2003. 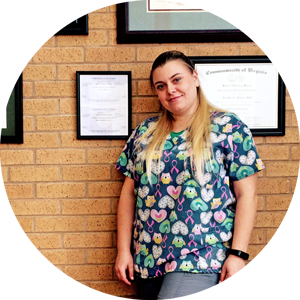 She was so taken by the family of animal lovers she found here, that in 2007 she took her career (and the practice) to a new level by getting a degree in Veterinary Technology from Northern Virginia Community College. Her interests include small animal and reptile husbandry, dog breeding, and pet behavior. She also loves sharing her veterinary know-how with owners who have questions about their pet’s health or behavior. At home, Jennifer and her daughter care for a bull mastiff, bearded collie, a boxer, and various pet reptiles. In her spare time, she enjoys showing her dogs in conformation and rally obedience competitions. Margaret Washington was born and raised in nearby King George County. After working toward a degree in Business Administration from Germanna Community College, she moved to Spotsylvania and joined the Animal Clinic in 1996. 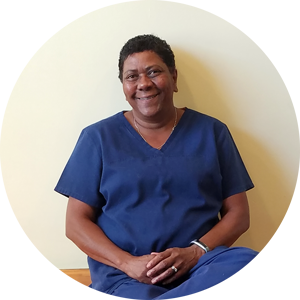 Her original title was Veterinary Assistant, but has put her experience and studies to work, and is now the clinic’s Patient Care Coordinator and Business Office Manager. When away from her many duties at the hospital, she loves to spend time with her daughter and granddaughter. She also cares for a spirited six-year-old lab named Frankie. Visit us in downtown Spotsylvania, Virginia! Welcome to Spotsylvania Animal Hospital! We’ve answered some of the more common questions we receive about our veterinary practice below. Feel free to contact us if you would like more information or do not see your question answered here. A: For your convenience, we accept Cash, Checks, Visa, MasterCard, Discover, and CareCredit. Payment is due at the time services are rendered. We also accept pet insurance! For more information, contact us. A: We see most types of small companion animals and exotic pets! Along with our dog and cat friends, we also see ferrets, rabbits, guinea pigs, potbelly pigs, chinchillas, hedgehogs, rats, mice, gerbils, hamsters, snakes (non-venomous only), sugar gliders, iguanas, monitors, turtles… and more! We do not see avians, or birds, spiders, large animal species (horses, cows, pigs, etc. ), or primates (monkeys). For more information about the pets we care for, see our services. We accommodate walk-ins on a first come first serve basis. Additional fees applied. Monday – Saturday. Emergency cases are seen immediately during office hours.